The Adventure of the Norwood Builder is another short Sherlock Holmes story published by Sir Arthur Conan Doyle. 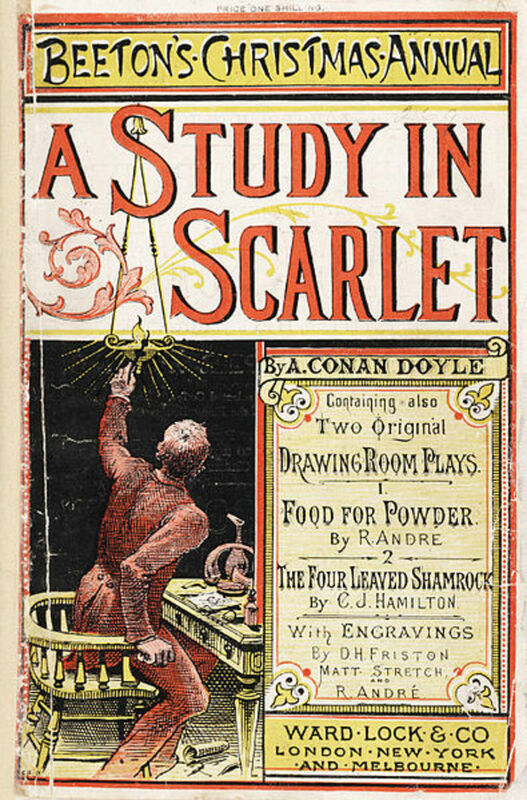 In the preceding story, The Adventure of the Empty House, Holmes had miraculously appeared in London, and in this story, Holmes has settled back into Baker Street, and is faced with a case of murder. 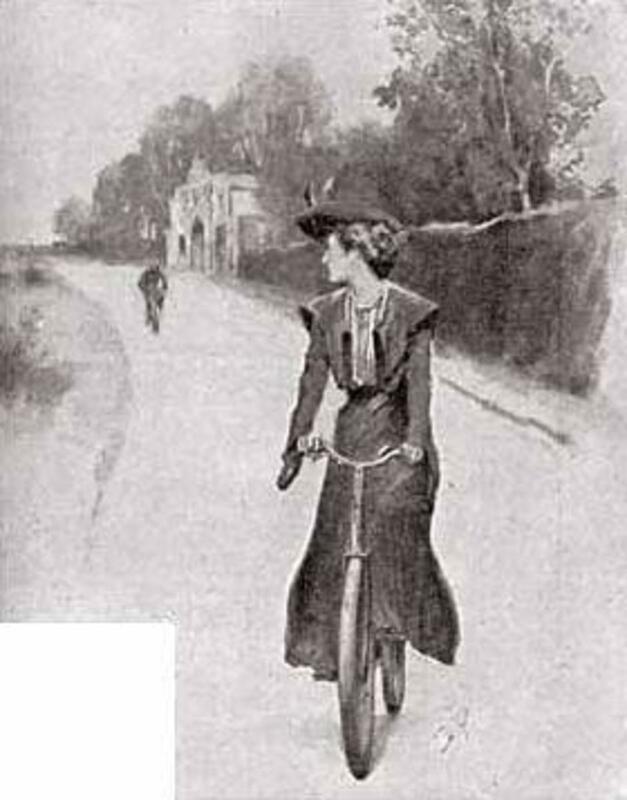 The Adventure of the Norwood Builder was initially published in the November 1903 edition of the Strand Magazine; and was the second short story published by Conan Doyle after the “resurrection” of Sherlock Holmes. Subsequently, The Adventure of the Norwood Builder would be published once again as the second short story in The Return of Sherlock Holmes. The Adventure of the Norwood Builder is the archetypal story of where the obvious should not always be taken at face value. The case of the Norwood Builder starts in the familiar way, with Holmes and Watson in their rooms at 221B Baker Street. This familiar opening though, raises some questions, as whilst Watson has sold his doctor’s practice for a good sum of money and moved back in with Holmes, there is the issue of what has happened to Mary his wife? 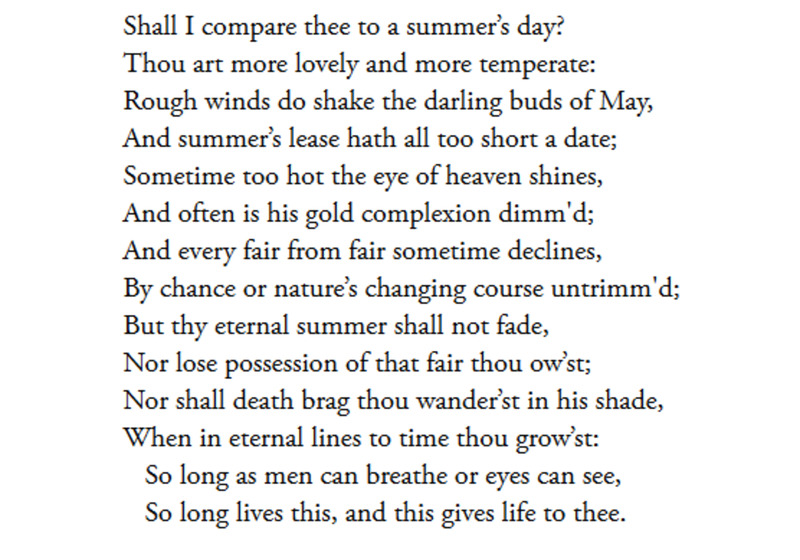 She is said to have passed away, but when this occurred or from what cause is never elaborated upon. The Adventure of the Norwood Builder also helps to develop the relationship between Holmes and Lestrade. Lestrade is triumphant when he believes that he has bested Holmes, but in the end it is Holmes who has to make sure that Lestrade doesn’t make a fool of himself. There is rivalry between the pair but also friendship. Holmes, of course, allows Lestrade to take all the glory for the successful conclusion of the case. Granada TV would make faithful adaptation of The Adventure of the Norwood Builder for television; and in September 1985, Jeremy Brett would star as Holmes in this adaptation. The Adventure of the Norwood Builder commences with Holmes and Watson once again living together at 221B Baker Street. Watson has sold his doctor’s practice for a decent amount of money, and has subsequently moved back in with his old friend. Several months had elapsed since Holmes himself returned to London, and now the detective is depressed about the lack of criminal ingenuity and endeavour since the passing of Professor Moriarty. Holmes’ depression though is soon lifted, as the arrival of Mr John Hector McFarlane heralds the possibility of an intriguing case. 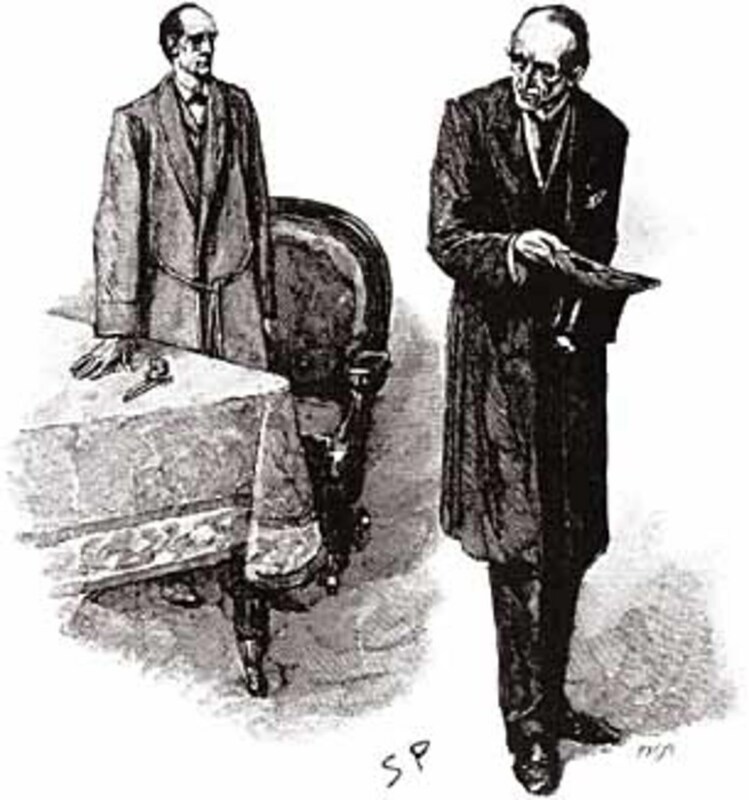 McFarlane introduces himself, but the name means nothing to Holmes or Watson, although Holmes does take the opportunity to deduce that McFarlane is an asthmatic, a bachelor, a solicitor and a Freemason. McFarlane apologises for interrupting Holmes, but the solicitor fears his own imminent arrest for the murder of Mr Jonas Oldacre, a builder from Lower Norwood. The Telegraph newspaper has already reported some of the details about the death of the Norwood builder; and it is from this source that Watson extracts the pertinent facts. Mr Jonas Oldacre was a 52 year old bachelor from Lower Norwood, who had disappeared from his home; this disappearance had coincided with the setting of a fire within the grounds of Mr Oldacre’s home. Inside the house, evidence of a struggle had been discovered, and a blooded walking stick that was not Oldacre’s had also been found. 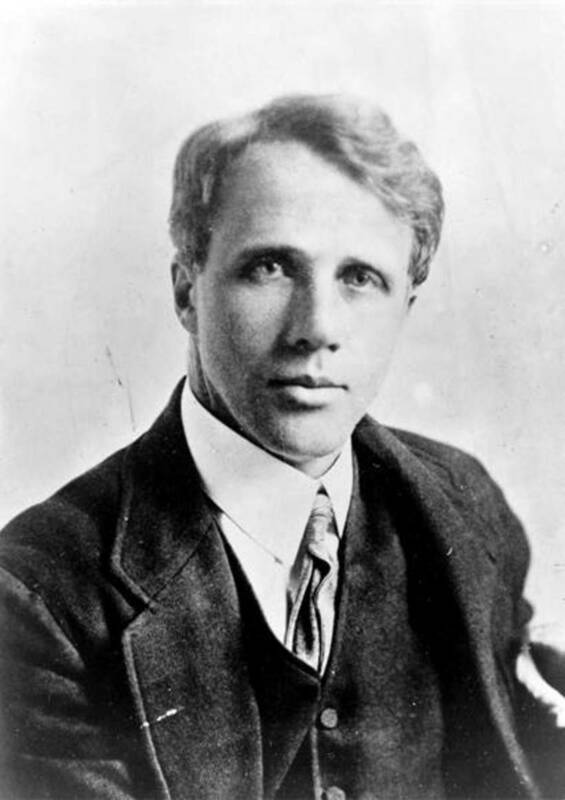 Oldacre was a well known Norwood resident, and was considered to be a wealthy man. On the evening of his disappearance, Jonas Oldacre was known to have entertained McFarlane at his home. The police investigation was being led by Inspector Lestrade, and the supposition was that Oldacre had been clubbed to death with the walking stick, and his body had then been burnt upon the woodpile found in the grounds. All this information had been garnered from the Telegraph, and so it seemed obvious that the only reason why McFarlane had not been arrested was because he had not yet returned to his parent’s Blackheath home. The fact that he had been followed since London Bridge Station though was an indication that the police were not too far away. Indeed, at that very moment, Lestrade entered Holmes’ rooms to make the arrest of Mr McFarlane. 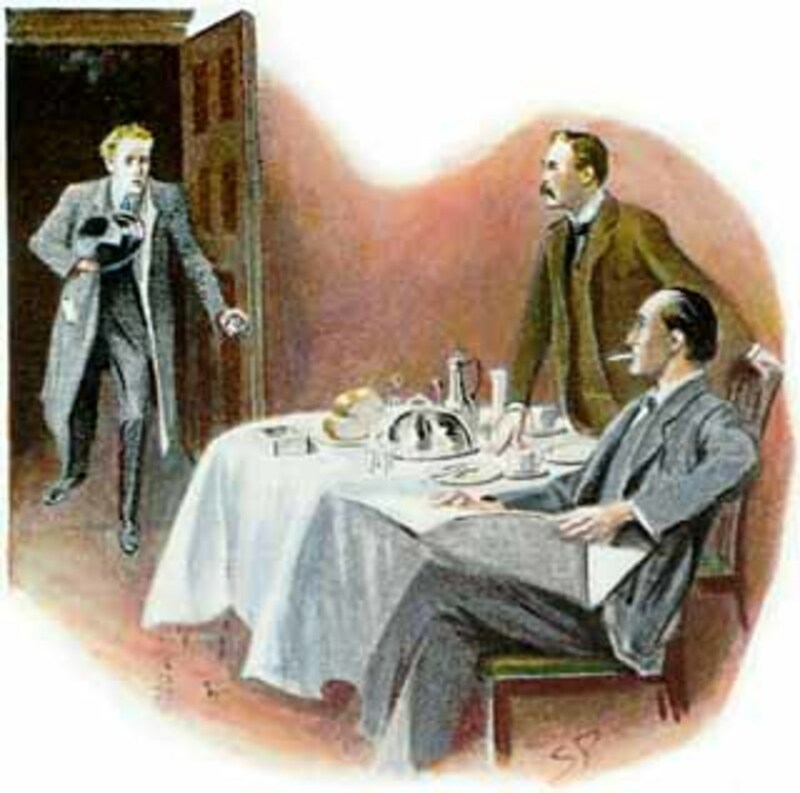 Holmes manages to convince Lestrade to allow McFarlane to tell his tale before he is taken away, and so McFarlane starts to narrate his story. Jonas Oldacre was a slight acquaintance of McFarlane’s parents, and the Norwood builder at arrived at McFarlane’s office to ensure the legality of a will that had written. When McFarlane had read the will, he was amazed to find that Oldacre had left everything to him; Oldacre stating that he believed the solicitor was worth of it. Oldacre then invited McFarlane down to Norwood to look at some of his other legal papers. Strangely though, Oldacre insisted that the meetings between the two men should be kept a secret from McFarlane’s parents. That evening McFarlane had travelled down to Lower Norwood, and had been admitted to the Oldacre residence by a housekeeper. Oldacre and McFarlane had then eaten a late supper, before the examination of the papers had been undertaken. Eventually, it was time for McFarlane to depart, although he had to leave without his walking stick, which had gone missing. With his story concluded, McFarlane is taken away; and of course all the facts seem to support Lestrade’s theory that McFarlane had killed Oldacre and then burnt his body. Holmes though quickly comes up with his own theory, one involving a passing tramp, which also fits all the facts. Holmes of course doesn’t believe his own theory about a tramp, but then again, Holmes doesn’t believe Lestrade’s theory either. McFarlane had brought with him Oldacre’s will, and Holmes examines it, and discovers that it has been written on a train journey, suggesting that it was never meant to be a permanent document. Holmes now springs into action, but his first stop is not Lower Norwood, but Blackheath, for as Holmes says, the apparent murder is only one strange aspect of the case, for of greater mystery is why Oldacre would leave McFarlane all his money. 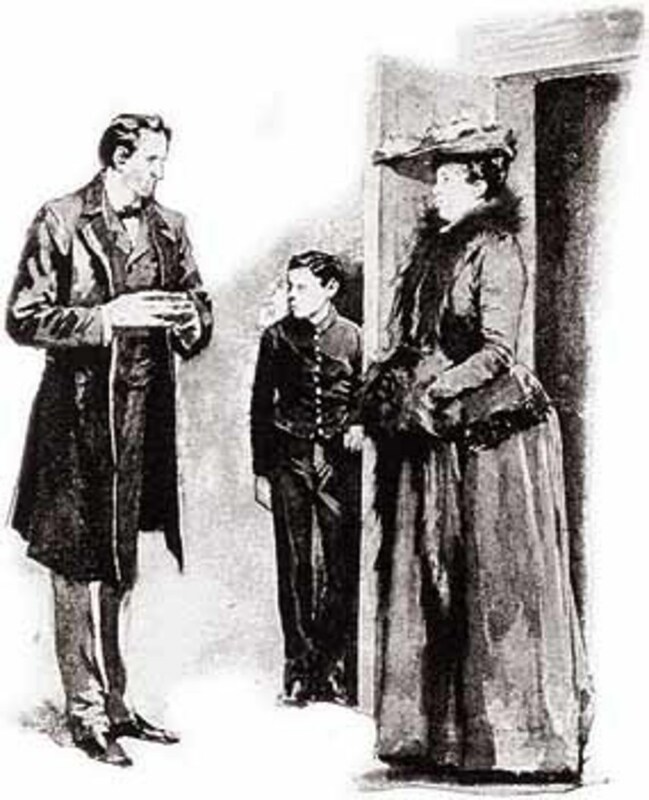 At Blackheath, Holmes visits McFarlane’s parents, and there his mother explains how she had broken off her engagement to Oldacre many years before when she had discovered his cruel streak. Indeed, on the day of Mrs McFarlane’s wedding Oldacre had sent a defaced picture of her to the couple. This news makes it all the more strange that Oldacre would leave his money to the son. Holmes travels on to Norwood, and there he finds that Lestrade’s theory is seemingly being confirmed with more evidence; as amongst the ashes of the woodpile, fragments of Oldacre’s clothing had been found. There is also evidence of a heavy bundle being carried to the woodpile. The only hole in the theory seemed to be missing papers from Oldacre’s safe; for there seemed little cause for McFarlane to have taken them. Additionally, the papers that remained also seemed to indicate that Oldacre was not as wealthy as people assumed, for his bank balance with nearly empty, a number of hefty payments having been paid to a Mr Cornelius. Holmes examines the house, but doesn’t find anything that would help his client; and so the detective returns to Baker Street. Later on, Lestrade asks for Holmes to travel down to Norwood; it seems fresh evidence has been uncovered, evidence that will cement Lestrade’s case. Has Lestrade finally got the better of Holmes? The fresh evidence proves to be a bloodied thumbprint of McFarlane left upon a passage wall. This new evidence had been discovered by Mrs Lexington, the housekeeper, and Lestrade is now certain of his case. The discovery of the thumbprint though does not dismay Holmes, for he too, is now certain of his case. 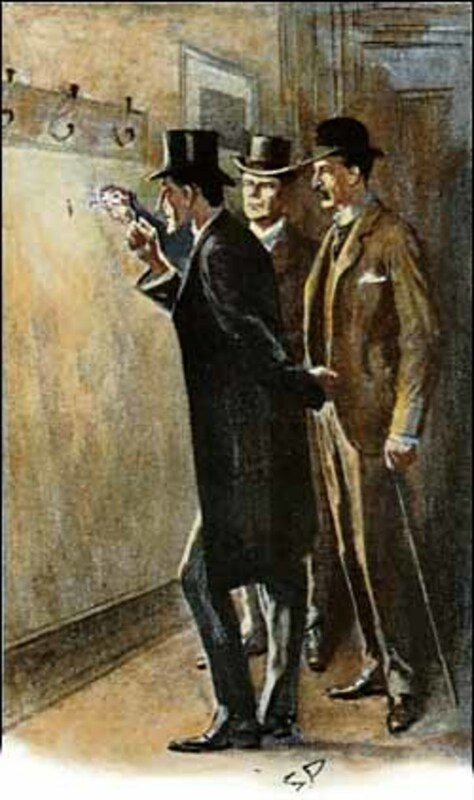 Whilst it is possible that the police may have missed the thumbprint during the examination of the house, Holmes knows that he had not; the thumbprint had appeared whilst McFarlane was in prison. 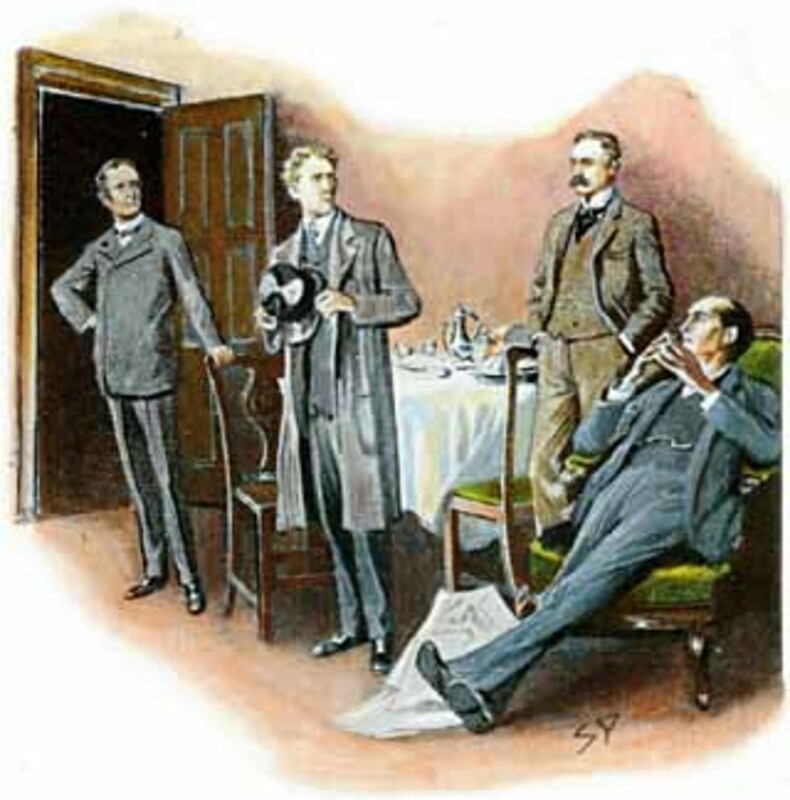 Lestrade departs to write his report, and in the meantime, Holmes and Watson make another thorough examination of the house, with positive results. 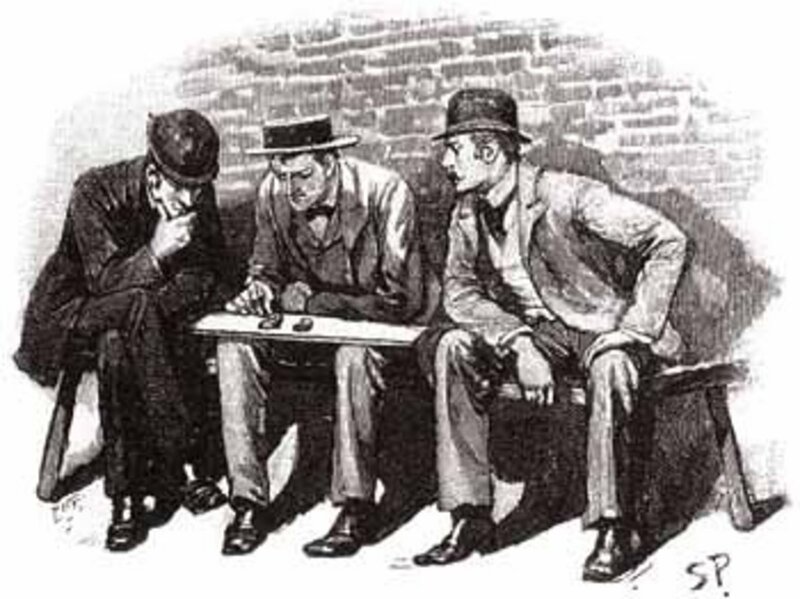 Holmes calls upon Lestrade, and states that the report will only be complete when the policeman interviews a new key witness. Holmes though cannot immediately produce this new witness, and the detective has a very strange method of getting hold of him. Holmes asks for three policemen with loud voices, and a couple of bundles of dry straw. Holmes then sets the straw alight upon the upper landing of the house, and then the three policemen, along with Holmes, Watson and Lestrade, all shout “fire” together. After several shouts, a hidden door opens upon the upper landing, and out runs Mr Jonas Oldacre. Oldacre tries to laugh all that has gone on as a practical joke, but Lestrade arrests the Norwood builder for conspiracy. As a builder Oldacre had managed to easily construct the secret room, and only the housekeeper had known about it; indeed, the room has been constructed specifically to help ruin the son of the woman who had jilted him. 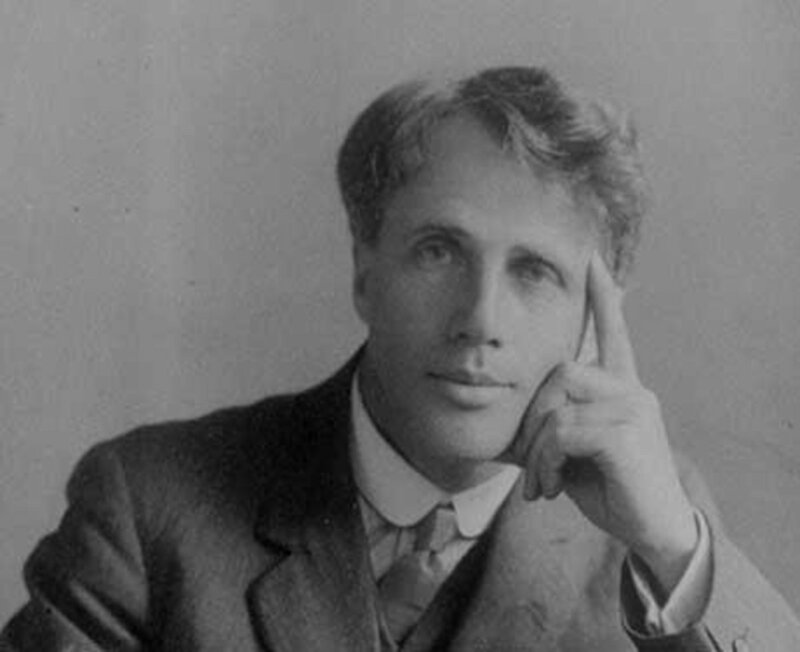 At the same time, Oldacre had sought to make a new start for himself away from his own creditors, and had created a new persona as Mr Cornelius. Holmes can easily explain the appearance of the thumbprint, with Oldacre taking a document seal and a pinprick of his own blood; but in trying to make the case against McFarlane certain, he had made it fatally flawed. Holmes has saved his client from the hangman, but at the same time has also saved the career of Lestrade. Holmes asks for no credit from the case, with all the acclaim going to the Scotland Yard inspector. There is one unanswered question about what was burned upon the woodpile? But it is not a question that Oldacre wishes to answer, and so Holmes makes the supposition that it was simply rabbits.